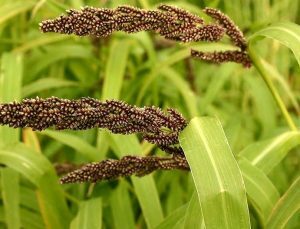 Vernacular Name : Indian barnyard millet, Sawa millet, Billion dollar grass, Japanese Millet (English); Jhangora, Vrat ke chawal (Hindi). Description : An annual herb or shrub, erect, 1-2 m tall; leaf sheaths smooth and glabrous; leaf blades linear, soft, 15-40 × 1-3 cm, glabrous, margins thickened and wavy; inflorescence erect, lanceolate, 10-20 cm, axis robust, scabrous along edges and with tubercle-based hairs; racemes 1-3 cm, curved, simple, closely spaced and overlapping; spikelets greenish, tardily deciduous, plump, ovate-elliptic to rotund, 2-4 mm, pubescent to hispid, awnless; lower glume 1/3–2/5 as long as spikelet; upper glume slightly shorter than spikelet; lower lemma herbaceous, sterile; upper lemma 2-3 mm. Distribution : Cultivated in Africa and Tropical Asia; widely grown as a cereal in India, Pakistan, Nepal, Japan and China. Phytochemistry : Seeds contain starch, fibre, protein, fatty acids, l-malic acid, trans-aconitic acid, (+)-isocitric acid, 5-O-caffeoylquinic acid, 4-O-caffeoylquinic acid, isocarlinoside, 2-O-rhamnosylisoorientin, 7-O-(2-O-glucuronosyl)-glucuronosyltricin, calcium, phosphorus and iron. Uses : Seeds are useful in the treatment of stomachic, biliousness, constipation, bloating and diarrhoea; seeds are frequently used in diabetes and cardiovascular diseases. Hey – great blog, just looking around some blogs, seems a pretty good platform you’re utilizing. I’m presently making use of WordPress for a few of my web sites but looking to alter one of them around to a platform similar to yours as being a trial run. Something in specific you would recommend about it? I just want to tell you that I’m new to blogs and truly liked you’re blog site. Almost certainly I’m going to bookmark your blog . You certainly have fantastic posts. Appreciate it for revealing your webpage. Thanks for your personal marvelous posting! I really enjoyed reading it, you may be a great author.I will make certain to bookmark your blog and will often come back later on. I want to encourage you to ultimately continue your great posts, have a nice morning!